In his biography of Richard, Paul Murray Kendall says 11-year-old Richard, duke of Gloucester, received commissions of array for Southwestern counties. Unfortunately he doesn't footnote these commissions. He says Richard "led his county levies northward through Worcester and Coventry to join the royal army ...." I realize some historians criticize Kendall's version of Richard's life; but if the commissions of array can be identified, Kendall can be considered right about this. Does anyone know how to find these commissions? According to Richard III; the road to Bosworth Field, Richard was elected a Knight of the Garter in 1465 when he was 13 years old. A color reproduction of his Garter Stall Plate with his arms as Duke of Gloucester appears between pp. 32 and 33. 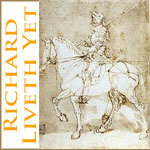 The authors make no connection between Richard's election and his possible recruitment for Edward IV in May 1464. Surprisingly, Kendall omits Richard's election as a Knight of the Garter. I have often thought this election might have been a reward for recruiting supporters for Edward IV in May 1464, but I've never seen any discussion of this possibility. It raises interesting questions: If Richard did recruit supporters for Edward IV, was this part of his knightly training? Did Clarence, Edward's heir apparent, also recruit supporters for Edward before he and Warwick rebelled? How did Clarence's knightly training compare to Richard's? Was Richard exceptionally young when he became a Knight of the Garter? Clarence was 12 when he became one. Did his position as Edward IV's heir apparent influence his election? Were kings' younger brothers routinely made Knights of the Garter? If so, what was the usual age of election? Are there surviving documents that could tell us more about Richard's and Clarence's Garter Stall Plates? I didn't know that John Howard moved into Richard's vacant Garter Stall after he became king. That's interesting. I can see that I'm going to spend some time exploring these links. I appreciate your effort to find them. I'm glad to know about this commission. It's 2 1/2 years earlier than the one Kendall wrote about. Richard was just 9 years, one month old, and he's included in the commission with 12 year-old George, the earl of Warwick, and several other lords and knights. It sounds to me like Richard and George are getting a 15th century version of hands-on training. I have never seen an author describe it that way, but the books and articles I've read haven't discussed this commission of array. Did Kendall and other authors miss this commission? Or did they think it wasn't worth mentioning because Richard was just 9? Did they assume that Richard didn't contribute anything to the recruitment, so it wasn't worth mentioning? Seems to me it's worth mentioning as part of his education. Was Richard unusually young? At what age did most lords' sons learn about raising troops and how did they do it? I can't answer any of your questions. But at least with the internet & electronic search capability that we have now, we can do our own investigation. I suspect the comparison group for George & Richard is vanishingly small (maybe Edward, Prince of Wales, son of Henry VI; and Edward, Prince of Wales, son of Edward IV?). But agree that it seems likely that it was on the job training. PMK was very good about documenting his sources, so you might be able to guess as to whether he knew about this commission (and chose to ignore it) by checking to see if he cites this source anywhere else in his biography. I was mistaken about Kendall's failure to footnote this commission. The footnote appeared on p. 54 of the Norton paperback ed. of Richard III, two paragraphs before the description of Richard leading his troops to Leicester on p. 55. I was focused on Richard and didn't realize the commission was described and footnoted on the previous page. Commission to Th., archbishop of Canterbury, William, earl of Arundel, and Henry, earl of Essex, the king's kinsman, and John Bourchier of Berners, knight, to array the king's able bodied subjects of the counties of Southampton, Surrey, Sussex, Essex, Kent, Norfolk, Suffolk, Hertford, Cambridge, Huntingdon, and Middlesex for the resistance of the king's enemies. The like to Edmund Grey of Ruthvn, knight, John Bourchier of Berners, knight, John Wenlok of Wenlok, knight, and Robert Harecourt, knight in the counties of Oxford, Berks, Bedford, Buckingham, and Hertford. The like to the king's brother Richard, duke of Gloucester, in the counties of Gloucester, Worcester, Warwick, Wilts, Somerset, Dorset, Devon, Cornwall, and Salop. Kendall was right about this commission. Richard is commissioned to recruit troops from 9 counties. George, duke of Clarence isn't included. It's interesting to compare Charles Ross' interpretation of Richard's early life with Kendall's. Ross doesn't discuss this commission or Richard's recruitment of troops at all. But he's very critical of Kendall's claim that Edward had more confidence in Richard than George. Maybe Kendall was wrong about Edward's opinion of his brothers, but this commission suggests that on at least one occasion, Edward thought Richard was capable of handling more responsibility than George. Maybe there were good reasons for George's absence. Looks like it's time for me to read about this from his point of view. Fascinating to see Richard named all by himself in that third commission of array - and for counties not in the north. Was he really that precocious that at age 12 he could be doing this all by himself? Haven't read J A-H's work yet on Clarence, but I gather that he was a workhorse himself, based on a comment on the Yahoo forum about his having berated a commission member for falling asleep during a meeting. I do know he was named to almost every Commission of the Peace in every county from 1467 until his death. If he attended even just some of the meetings of these commissions, he must have been on the road almost as constantly as Richard was as king. And perhaps there was justification for his traveling with a retinue of 200 if he had that much business to transact. I can't answer any of your questions. But at least with the internet & electronic search capability that we have now, we can do our own investigation. I suspect the comparison group for George & Richard is vanishingly small (maybe Edward, Prince of Wales, son of Henry VI; and Edward, Prince of Wales, son of Edward IV?). But agree that it seems likely that it was on the job training. I thought about Henry IV's heir, who was leading troops as Prince of Wales. I need to refresh my memory about his age. I believe he was older than 9 or 11. Henry VI's and Edward IV's heirs would be worth studying, too. I have a fuzzy memory about armor made for Henry VI when he was 8 years old. That seems both sad and ironic in hindsight. Actually, the youngest sons--Humphrey, duke of Gloucester and Richard, duke of York--would be more directly comparable to Richard, duke of Gloucester. I doubt that Edward IV had money to pay Richard's bills in advance. So that 1,000 pounds is likely to mean that Richard was in Warwick's household before the 1465 payment. How long would it take for him to run up a 1,000 pound bill? More than 2 years? If Richard began on the job training as early as the commissions suggest he did, he might have been ready to leave Warwick's household sooner than usual. I remember reading that he might have studied law at the Inns of Court. Maybe he went from Warwick's household to the Inns of Court. I think Richard must have had help. He had a ducal council after 1471; but I don't know who would have helped him before then. Seems to me Warwick would have delegated some of his mentoring duties, but I don't remember reading about it. I need to read John Ashdown-Hill's book, too. Have you read Hicks'? I haven't, because I've read his mistreatment of Anne Neville and his book on the Wars of the Roses. I think I need to modify my opinion of Clarence. I have Hicks' book, purchased before I understood his point of view, but have studiously avoided reading it. I simply won't support his work if I can help it. I'd like, for instance, to see someone else review Richard's account books. That 1000 pounds was also to cover the wardship of Francis Lovell. Somewhere recently I also saw the suggestion that Richard might have spent time at the Inns of Court. So little time, so many groups, let alone finding & absorbing original source material. Thanks by the way for pointing out that additional Commission of Array. I didn't yet have it on my spreadsheet. I haven't got time now to go hunt up the reference because it's twenty past three in the morning here, but I know that a couple of years before we know for sure that Richard was in Warwick's household, he and George and Warwick and Warwick's brother (whose name I've forgotten) (uh, Montague?) were all given a commission to raise levees in the north. It might just have been a London-based desk job - on the other hand it might have been a propaganda exercise which involved riding around the north so people could see them and go "Ah, look at the sweet little boys, of course I'll fight for their brother", and in that case Richard might well have been based at Middleham for months and have incurred expenses. Here are two citations about nobles' education. I've read the first one. I don't know if the second is too general to be helpful, but it looks like it's worth investigating. 1- Sutton, Anne F. A curious searcher for our weal public. in Richard III, Loyalty, Lordship, and Law. London: Richard III and Yorkist History Trust, 2000, pp. 69-105. P. 91 covers education for knighthood; p. 95 covers legal education. 2 - Orme, N. From Childhood to chivalry; the education of the English kings and aristocracy, 1066-1530. London/NY, 1984. Henry Prince of Wales, duke of Aquitaine, Lancaster, and Cornwall, earl of Chester, and heir apparent to the kingdom of England became a Knight of the Garter in 1399. He was 13. The royal council appointed experienced administrators to help him govern his patrimony. In August 1400, he accompanied Henry IV's unsuccessful expedition into Scotland. From Sept. 1400 to his death Hugh le Despenser served as the Prince of Wales' governor. The Prince also had his own council. After Despenser's death, the Prince's relationship with his new governor was "more formal than real" because this governor was also lieutenant of S. Wales. Prince Henry not only led troops, he had to pay the expenses of suppressing the Welsh rebellion out of his personal income. After the Welsh captured Conway Castle on Good Friday, 1401 Prince Henry took part in the siege and the castle's recapture. The 1404 parliament gave Prince Henry "general oversight of war" against the Welsh. In 1406, Prince Henry became the king's lieutenant in Wales. He was 19. Christopher Allmand wrote that the Welsh conflict occupied nearly a decade of Prince Henry's life. Henry IV and parliament held Prince Henry responsible for governing Wales, suppressing rebellions, and paying expenses from his own lands' revenues. "Conflict was to be a determining factor in his career and in the formation of his character." So when Richard received the May 3 1464 commission of array, he was about 2 years younger than Prince Henry when he accompanied the Scots expedition. Archibald Constable and Co., 1907. Humphrey became a Knight of the Garter in 1400 at age 10. On May 16, 1414, he became earl of Pembroke and duke of Gloucester. Although K.H. Vickers suggests Humphrey may have been educated for a church career, Humphrey's military successes in France suggest he received military training at the normal age. In 1414, Humphrey recruited troops for Henry V's French expedition and in 1415, he served on a committe that raised loans from London merchants. If he hadn't fought before, he began his military career around age 24. Yet he earned Henry V's confidence and a reputation for "courage bordering on rashness." So Humphrey seems to have become a Knight of the Garter at a younger age than Richard, but to have begun active military service 10-11 years later. The apparent late start may be due to lost records. Vickers' biography is very detailed, and he probably would have found such records if they had survived.